If you can the ceremonial start is worth going to as the drivers give short interviews and the cars are still in good condition. 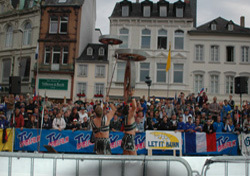 The warm up was two German blokes wearing odd leather costumes juggling parts of a Roman chariot . A sight that can only probably be seen here and despite my better judgement I have to say they were very good at it. Petter Solberg looked a little bit embarrassed a he walked over the start ramp. 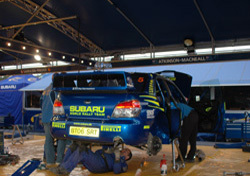 He was probably feeling a little bit guilty as his mechanics worked flat out to repair his car after a major accident on the shakedown which they succeeded in doing by the early hours off the morning. 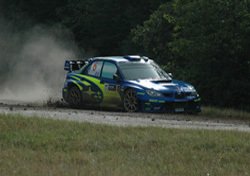 The Rally Germany was again run to the same format as 2005. The rally consisted of three distinct legs.